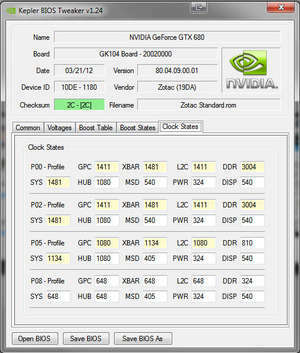 Kepler BIOS Tweaker is a tool which modifies the settings of NVIDIA graphics adaptors like the core voltage, fan speed, power limit and overclock settings. The core voltage is the voltage applied to the GPU processor. Generally speaking, the higher the voltage, the higher the clock speed your GPU can reach. Now, for Kepler cards, you don't have to worry about damaging your card with voltages, because Nvidia decided to put a software lock on voltages at 1. Version 1.27 is a freeware program which does not have restrictions and it's free so it doesn't cost anything. For security reasons, you should also check out the Kepler BIOS Tweaker download at LO4D.com which includes virus and malware tests. Additional screenshots of this application download may be available, too.